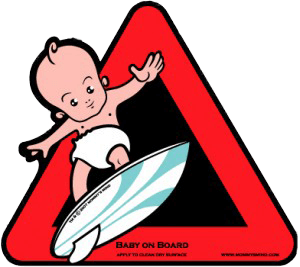 Like many things, the ‘BABY ON BOARD’ signs started off as a good thing and quickly became an annoying, gimmicky eyesore. The signs were originated in 1985 by a child-safety oriented company as a way of letting parents inform drivers around them that extra care should be taken to protect the small inhabitants within. Initially, the public reacted very favorably to the signs leading several other companies to begin marketing their own versions of the sign as well as alternative signs – it was these alternatives which would become their undoing. In the early months of 1986, hundreds of different signs were popping up in car windows everywhere, ranging from safety warnings (‘STUDENT DRIVER INSIDE’) to pathetic sexual references (‘IF THIS CAR IS ROCKIN’ DON’T BOTHER KNOCKIN’ ‘). Besides the annoying silliness which caused many fellow drivers to shake their heads, the signs also posed a safety hazard as owners often placed them in areas which obstructed the driver’s view. As such, many states began to regulate the use and positioning of the signs within cars. By 1990, few drivers believed that anyone heeded them as a safety measure or as a source of humor and thus abandoned their use.